A nonprofit international development organization founded in 1971, Pact works on the ground in nearly 40 countries to improve the lives of those who are challenged by poverty and marginalization. We strive for a world where all people are heard, capable and vibrant. communities challenged by poverty and marginalization. a world where everyone owns their future. systemic solutions in partnership with local organizations, businesses and government. People are aware of and express their needs and rights in a receptive system. People have skills and resources and apply them in an enabling environment. People are healthy and communities are economically prosperous. Pact works in Africa, Asia, Europe and the Americas. Click on a country to learn more. 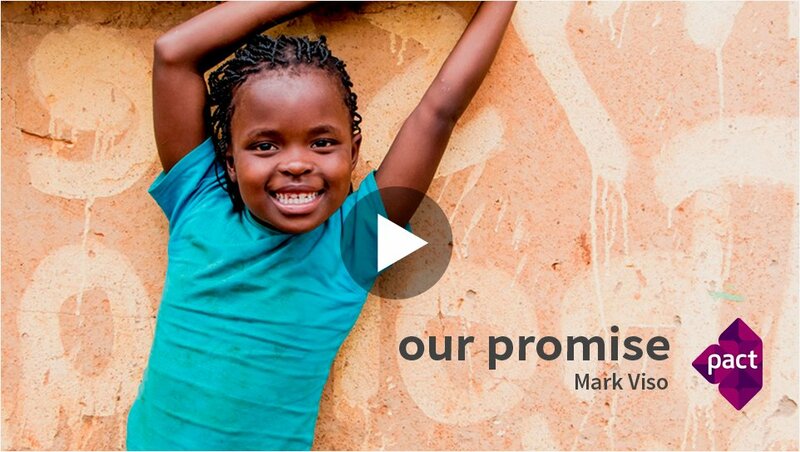 Every year, we keep our promise to millions of people. In 2018, 2.5 million people gained access to improved health and social services because of Pact’s work. More than 1.1 million enjoyed increased income and savings. Nearly 1,200 of our local partner organizations improved their performance.